Fear and Trembling continues to fascinate and frustrate all who find, for many reasons, that they must struggle with it. Not only 'professional intellectuals,' but students and other seekers perennially wrestle with it, working their way through its difficult dialectic. Both philosophers and theologians are provoked by the prominence of typically Kierkegaardian terms, categories, and arguments—paradox, resignation, faith, the absurd, the individual, the poet, immediacy, the ethical, leap, offence, silence, and others. In Fear and Trembling Kierkegaard challenges many of our modern assumptions, and he will continue to frustrate and fascinate us for so long as we attempt to sort out ourselves and our times. 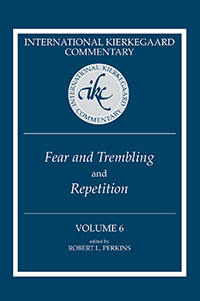 IKC 6 includes the first collection of essays to concentrate the talents of a number of scholars on Kierkegaard's obscure little book Repetition which is, in a word, about hope. Kierkegaard suggests that in the midst of our epistemological errors, the weakness and/or arrogance of our wills, and in making fools of ourselves, or being made fools of, there is everlasting hope for us. Repetition indeed goes to the heart of the matter, to the core of human existence.